Shia LaBeouf has had a rough couple of weeks as his livestream protests have been interrupted by trolls time and time again, no matter how hard he tries to prevent it. He has been outspoken against the Trump presidency and has run his own “He Will Not Divide Us” art protest campaign, which the Internet has done everything in their power to hinder and have fun with. After having his first two livestreams foiled by trolls, LaBeouf decided to move his protest to an undisclosed location that he kept a secret for weeks. 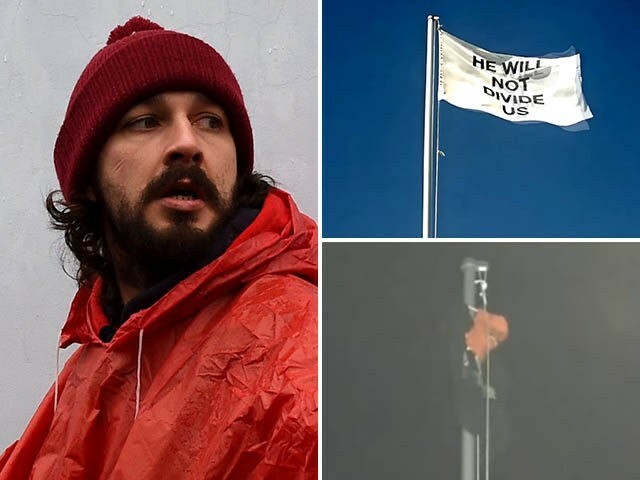 Users on the Internet immediately began trying to figure out how to track down the location of the flag so that they could remove it, moreso as having fun with LaBeouf rather than having it be any sort of political statement. 4chan users began to track planes that were flying over the flag. The camera was angled up towards the flag so that there weren’t any visible landmarks, but this opened up access to the sky. Beyond just studying planes, at night users were looking at the position of the stars and during they day they were tracking the position of the sun at certain times. Eventually LaBeouf slipped up and posted a photo of himself in a diner in that state of Tennessee, and the game was on. One user drove around the estimated area honking their horn while others listened on the live stream for the sound to figure out how close they were. They were eventually able to find the specific location of the flag, and removed it from the pole. It was replaced with a “Make America Great Again” Trump hat and the users left. This was done during the livestream so everyone got to watch the action unfold. LaBeouf took down the stream later that day. When the stream was turned back on it featured an empty flag pole. People are already waiting for the next livestream position so they can figure out where to go to take down the stream once again.